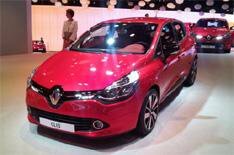 New Renault Clio unveiled | What Car? This is the all-new Renault Clio, which has been launched at the Paris motor show and goes on sale in next month. Renault has already launched its Twizy quadricycle and an updated Megane in 2012, while the Zoe electric supermini will be on sale before the end of the year. None of these models is as important as the new Clio, though, because its the replacement for the companys biggest seller. Like the Zoe, the new Clio gets a diamond-shaped front grille that incorporates a huge Renault badge and sweeps back into the headlights, but the Clios styling is a little more aggressive; it takes its inspiration from the dramatic Dezir concept that was shown at the 2010 Paris motor show. Instead of all-new mechanicals, the latest Clio uses a modified version of the outgoing cars platform. Fortunately, thats an excellent starting point, and Renault says it has concentrated on making the new car more rewarding to drive. For the first time, the Clio will be offered as a five-door hatch only, which is a brave move when almost half of UK Clio buyers currently opt for a three-door. Still, Renault has hidden the rear door handles in the window frames in an effort to make the car look sportier. A sleek lifestyle estate will also be sold in some markets, but there are no plans to bring this to the UK. What we will get is a Nissan Juke-style mini SUV thats based on the new Clio. Cheaper versions of the current Clio have hard cabin plastics that look like baked elephant hide, whereas every model in the new range features cushioned materials that are easy on the eye and softer to the touch. A touch-screen infotainment system that will be standard on mid-spec Dynamique cars and above adds to the classy feel. This should be easier to use on the move than the touch-screen in the rival Peugeot 208 because it features bigger icons that are easier to hit. The system, which Renault calls R-Link, not only controls all stereo, phone and navigation functions, but will also support various downloadable apps that help you do everything from send tweets to locate the nearest petrol station. Most people should be able to find a comfortable driving position in the new Clio, too, because the steering wheel adjusts for reach and rake on every model (lower-spec versions of the outgoing car miss out on reach adjustment). That said, over-the-shoulder vision is restricted due to thick rear pillars and tiny rear quarterlight windows. Interior space is comparable with rivals such as the Ford Fiesta and Volkswagen Polo, which means a six-foot passenger can sit behind a similar-sized driver without too much discomfort. Only the versatility is a little disappointing; while the boot is well shaped, theres a large step in the extended floor when you fold the rear seats flat. Buyers of the new Clio will be able to choose from two 89bhp engines: a 1.5-litre diesel and a new three-cylinder 1.0-litre turbo petrol. The diesel boasts class-leading efficiency figures it averages 88.3mpg and emits just 83g/km of CO2 while the petrol manages a still impressive 65.7mpg and 99g/km of CO2 in its most efficient form. Shortly after launch, these engines will be joined by a 118bhp 1.2-litre turbo petrol that will be offered exclusively in a GT trim that brings sportier styling and firmer suspension. A full-blown Renaultsport hot hatch will follow later, although this will ditch the current cars high-revving naturally aspirated 2.0-litre unit for a punchier 1.6 turbo that produces more than 200bhp. Renault is still to confirm what gearbox the new Renaultsport model will get, but the other three engines are all linked to a five-speed manual box; a six-speed twin-clutch semi-auto will be an option on the 1.2. Prices and specs are still to be confirmed, but Renault says the new Clio will have a lower starting price than its predecessor and come with more standard kit; even the base model should get air-conditioning, remote central locking and a stereo with an aux-in socket. In addition, there will be lots of options to let you personalise your car, including exterior decals and brightly coloured interior trims.